It was another year in a row for Barterhouse partnering with the Adaptive Sports Foundation. One of our favorite charities, the Adaptive Sports Foundation serves individuals with disabilities through adaptive sports programs. The non-profit organization provides profound and life changing experiences for children and adults with physical and cognitive disabilities and chronic illnesses through outdoor physical activity, education, support and community. 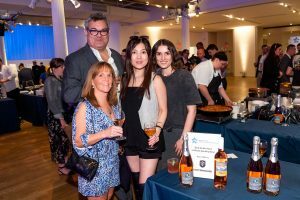 The 5th Annual Warriors in Motion was an incredible turnout–world-class chefs, top restaurants and food artisans, and trade insiders, all came together to support participating injured United States servicemen and women. The Barterhouse team had a great evening; we ate and drank and danced the night away! We poured two of our favorite wines–Bord De Mer Pays d’OC rosé and Domaine Du Grand Cros Rivale Sparkling rosé. Everyone was enjoying the wine, which thankfully lasted us right to the end of the evening! Barterhouse donated a bottle of Champagne Jeeper Grand Assemblage to the raffle portion of the evening. We are always so impressed by this wonderful organization and the incredible events that they put on–we cannot wait for next year! The Barterhouse leadership and advisory team has over 50 years of combined business experience in product marketing, brand strategy, and the advertising business. At Barterhouse, we never forget that, although wine can be a valuable investment commodity, it is always one of life’s greatest pleasures. Complete the form below to get our prices emailed directly and schedule a tasting.